// The Police Called Me for Questioning, but I Haven’t Been Arrested. What Should I Do? The Police Called Me for Questioning, but I Haven’t Been Arrested. What Should I Do? On TV and in movies, we see the bad guys get arrested and then taken down to the police station for questioning. In real life, though, it doesn’t always happen in that sequence. Sometimes crime suspects are asked to come in for questioning even before they are arrested. But why? It’s a trap used by law enforcement. Police officers know that most people are scared of going to jail. So if you’re arrested first, that fear is now gone and the harm has been done. You’re not as scared because you have already been arrested. Therefore, police officers use the tactic of interrogating you first. They may call you or stop by first. They try to coerce by acting like your friend. They just want you to talk and tell your side of the story. They get you to believe that you can trust them. But the truth is that they already have a preconceived notion that you’re guilty. Their goal is to brainwash you into a false confession. They want you to fall for it so you won’t get arrested. If you are being questioned without an arrest, a police officer does not have to read you the Miranda rights. However, what you say can and will still be used against you. And to make things worse, the questions a police officer has for you are often trick questions, and the way you answer them can make you look guilty. The officer really wants to arrest you because he thinks charging you with a crime will solve the case. This can seem scary, but the truth is you don’t have to worry about answering these questions. Why not? All you have to tell the police officer is that you want to have your attorney present. That’s it. The police officer won’t tell you that you have that right, but you certainly do if you’re ever in a legal situation where your rights and freedoms are at stake. This statement works in two ways. The police must stop questioning you right away. Also, it shows that you are not trying to hide anything or be uncooperative. You simply want to protect your legal rights by having a criminal defense attorney present. If the police officer gets angry, then you can tell that he wanted to trick you into a confession. However, if the officer is fine with you getting an attorney, then there was no prejudging involved and the officer is truly trying to solve the case without ill intent. If you have been called in for questioning by police, make sure you understand your legal rights. Without a lawyer on your side, you could end up in jail for a crime you didn’t commit. Don’t let this happen to you. 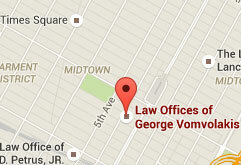 The Law Offices of George Vomvolakis can help preserve your innocence. To learn more about how we can help, give us a call today at (212) 682-0700 or contact us directly online for a free case evaluation.